Penguins. Such graceful creatures. Mommy never told us why these birds don't fly, but here's proof that this won't be a concern for our little 'uns. 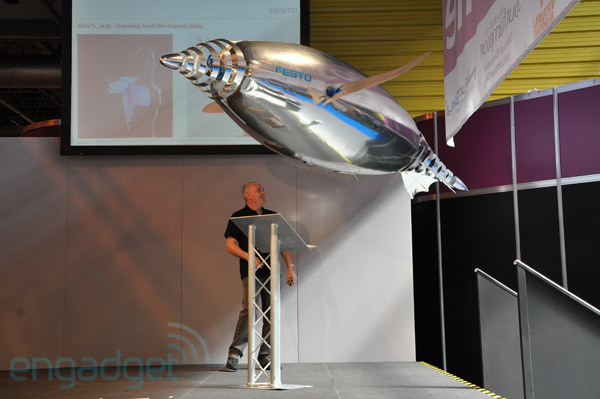 What you're looking at is the Festo AirPenguin's rare appearance outside its German labs -- the Gotengo-esque airship is at The Gadget Show Live in Birmingham, UK this week. Sure, this baby's a bit old, but being up close and personal with it is way more sensational than watching the mere 40-second-long segment from last time, and at least we now know it's the real deal. Video after the break.